Vonzell Solomon: The Latest Airport Terrorist? In, “I Forgot You Existed Until I Read This Story and Then Remembered That You Do Exist, You Aren’t Dead, and You Used to Be on a Show, But Haven’t Thought of You in Years and After Thinking About It Am a Little Surprised You Haven’t Done More With Your Career” news, Vonzell Solomon from American Idol, a few years ago, was stopped by the Florida airport security when they went through her bag and found a gun. Yes, a gun. Being an ex American Idol contestant is highly dangerous lifestyle. That’s funny because I said, literally, the exact same thing yesterday morning about my 4 oz deodorant when the screeners found me trying to smuggle it onto the plane in my carry on bag. 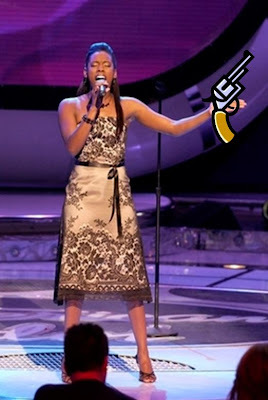 Also noteworthy, (A) why does Vonzell have a gun and (B) why didn’t she bring it with her on stage while she was on Idol? If she fired it into the air while singing “I Will Always Love You” I would have voted 3 additional times for her……er…uh…I mean, I would have voted for her. What is American Idol Even About?